Join us on Foxy Lady to discover perfect bays and secret spots, adventure where privateers and pirates once roamed and sail downwind with the sun on your face and drink in your hand. Sit back and soak up the sun on one of Foxy Lady´s many couches and sun beds, or take a well deserved nap in your fully air conditioned cabin. Snorkel or dive a sunken wreak, tropical reef or in the sandy shallows right off the beach or the back of Foxy Lady, and afterwards enjoy a refreshing shower on deck. Join in for themed nights, cocktail parties, children games, sundowner treats and delicious 3 course meals. Get involved in the sailing of Foxy Lady with the enthusiastic advice given by your captain. Watch as your children enjoying a thrilling ride on the tube behind our brand new tender, or play hide and go seek on the best floating toy ever! See them take an interest in the fascinating underwater world or learn first hand why the ocean glows at night. How would you like to be guaranteed to catch (and release) a fish off the back of Foxy Lady at night, or partake in a amazing night swim to view the fish and stingrays attracted by Foxy Lady´s underwater lights? Star Gazing and stories up on the Sky Lounge with treats or a romanic after dinner set up with fluffy blankets, pillows, soft music and lots of lanterns. To share a quote from a local, ´our beaches are still beautiful, our seas are still blue, our drinks are still cold´. Children´s entertainment activities (coloring books, lego, beading). Children´s activities and themed parties. Fantastic night swim to view the tarpon and stingrays attracted by Foxy Lady´s underwater lights. Feel the thrill of jumping off Foxy Lady´s boom whilst secured over deep water under the watchful eye of the captain and after a safety briefing. They are both commercially endorsed Yacht Masters, with over 45 000 nautical miles between the two of them and multiple Trans Atlantic crossings. They have been chartering and sailing together as captain and chef for the past 4 years, from Panama and Columbia to the Virgin Islands, Bahamas and east coast of the USA. Jason completed a delivery in 2013 from Cape Town, South Africa to the Caribbean, around the same time Kate came across aboard her parent´s charter catamaran. Their yachting careers took them to Fort Lauderdale, where they met whilst working aboard Super Yachts. 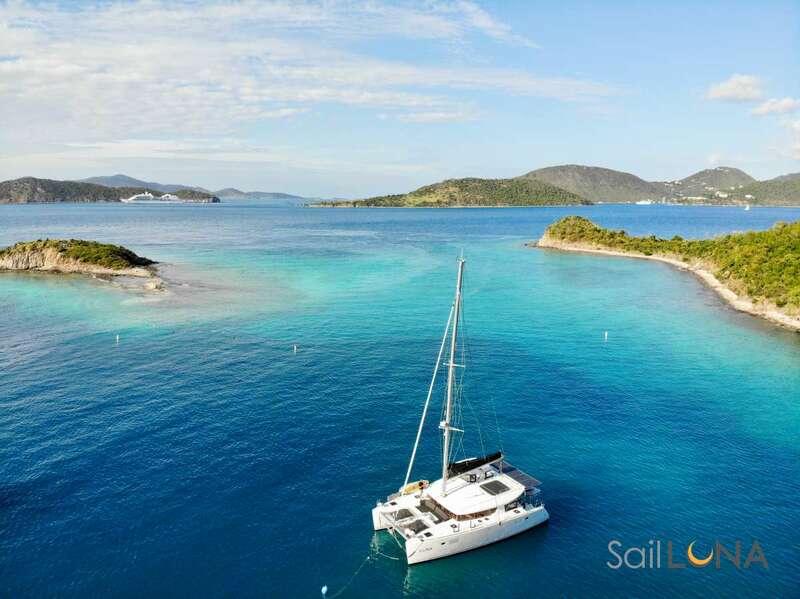 After working successfully aboard larger yachts, they decided it was time to branch out on their own in the Virgin Islands and are proud to be the team aboard Foxy Lady. Offer: Foxy Lady will be offering charters in August 2019 in the Grenadines with just two crew and 3 dives included (max two dives in the Tobago Cays). All costs related to diving and cruising permits covered, but weekly rental for personal dive equipment is for the charterer's account (BCD, Wetsuits, Regulators). Tank, refills, masks and fins provided. Charter cost for 1 week for 8 people is $29 800. Send us an inquiry to get specific pricing for Foxy Lady. I can imagine no better charter boat experience than what we enjoyed on Foxy Lady with Jason, Kate, and Tayla. The boat itself was immaculate, spacious, beautiful, and comfortable. What really put our trip over the top was the crew. As a mom of three (ages 10, 8, and 5), vacations can be utterly exhausting for the parents! That was not the case this time. Every crew member took time to engage with our kids - they played board games daily, took them tubing, indulged their desire to chat about random topics, hosted a pirate party, swam with them (including a mermaid tail lesson! ), put on an elaborate treasure hunt, gladly made grilled cheese or PB & J for the picky one, welcomed the kids’ endless “help” with setting the table, making drinks, sailing, or even fileting a fresh fish to make ceviche. When we snorkeled, they constantly checked on them to make sure they were comfortable and having fun, offering to take the youngest one back to the boat when she got tired so the rest of us could keep going. It was almost like combined they were an extra crew member assigned to look after the kids. They did this stuff seamlessly, cheerfully, energetically, and all the while seeing to their everyday duties and making sure we four adults felt equally spoiled. We all adored our week on Foxy Lady and would recommend it to families who want to experience an adventure in paradise together. Kate and Jason did a fabulous job of keeping all of our rooms, the salon and their busy kitchen neat and clean. They were also amazing at hanging our towels each time we came out of the water and making sure the deck was clean at all times. This is our 5th time chartering and both Jason and Kate were hands down our favorite crew! This is the top captain and chef we have ever had on our private charters. They were both attentive to what we wanted to do while taking into account the conditions of that day. They organized a treasure hunt for our 4 year old grandson. Kate drew an amazing map based on the landscape of where we were, I think it was Peter Island. She burned the edges of the map and stuffed it into a bottle. They put it in the water at the front of the yacht so that it would float down and in front of my grandson allowing him to ´discover it´. Everyone jumped into the water and headed to shore. Poor Jason had to make at least 3 prior trips in to add additional clues and bounty. They turned our family trip into a magical adventure! The crews expertise was exceptional. They sometimes had some challenging winds to deal with. Jason handled the boat well in all conditions. Kate too. We had a previous charter where the food was awful. Since then we have always specified that we wanted someone who knew how to cook. WOW can that girl cook. She sometimes had to make 3 different meals for one dinner. One for my grandson, one for someone who was allergic to the main course and the main course. Would we charter this yacht again? YES!!!! We are heading back out with Jason and Kate in November and would not consider sailing with anyone else after being with Jason and Kate. My daughter said to me today, Dad you know when we were on board Dolphin Splash it felt like I was in a dream, it was like the Disney World cruise, but better! I can say that making my children happy also makes me delighted, so all of us really loved being with Jason and Kate. It worried me a little that my family and I were going to have strangers at every meal, but I was surprised (I bet it was their mega yacht experience), that at many meals they were nowhere to be seen, very smart, we all had our family bonding time, then they would magically appear and be serving wine. The first impression always impacts people the most, my wife and I were happily impressed with our crew. Every single aspect of this charter on board was magnificent! The kids insist we get back with Jason and Kate, see you soon. Finally we get to send you both a note of thanks for making our BVI experience beyond our expectation. We appreciated the attentive concern you professionally provided to both of us. Hope all is well, we have shared our photos with family and friends and continued to hi-light our captain and chef at every opportunity. You are an awesome couple. Again, many thanks and Big Hugs! We are having a fabulous time, and could NOT have a better crew! We HIGHLY recommend Jason and Kate!!! We would definitely charter with the crew again! Our trip was absolutely marvelous and full of wonderful memories! Thank you to Kate and Jason for making our end of 2015 and beginning of 2016 so very fun and spectacular! The main event which I´m happy to customize and alter to suit every palate and preference.